Owl you need is love. 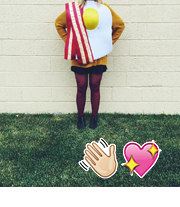 Who whooooo would you rather have as your Valentine? Owl always love you! Owl always think you’re a major hottie. Hootie hoo. These cookies could be given as Valentines. You could attach notes that say things like those ones up there. Owl bet everyone would really love it. Especially the one where you tell them they’re a major hottie. 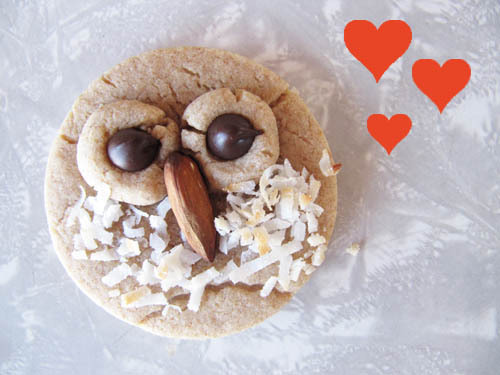 Did you know that coconut turns into owl feathers in the cookie world? 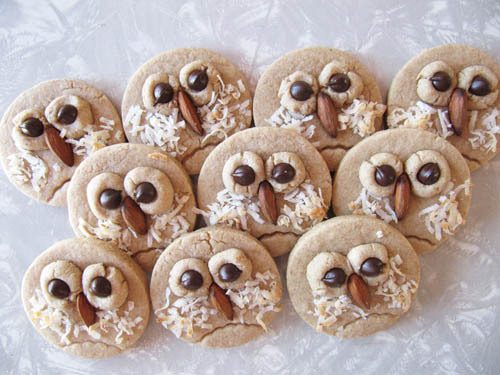 And these cookies turn into owls without any decorating post-baking. It’s a cookie miracle! The picture below is an owl family portrait. I wish they would’ve smiled, but at least they didn’t all wear matching turtlenecks, right? That would’ve been awkward. * I used 2 cups all-purpose and 1 cup whole wheat. So, do that if you want! Whisk together the flour, baking powder, salt and spices in a medium bowl. In the bowl of a stand mixer (or in a large bowl using an electric hand mixer) beat the sugar, brown sugar and butter together until light and fluffy, 2-3 minutes. Blend in the egg and vanilla. With the mixer on low speed, mix in the dry ingredients until just incorporated. 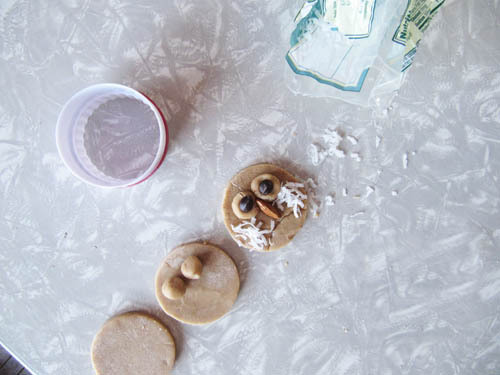 Form the dough into a disk and wrap in plastic wrap and chill until firm, 30-60 minutes. When ready to bake, preheat the oven to 350ºF. Line baking sheets with parchment paper and set aside. On a lightly floured surface, roll the dough out to about 1/4 inch thickness. 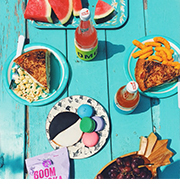 Cut out using a (2 1/2 inch) round cookie cutter. Roll out 2 small balls of dough for each cookie. 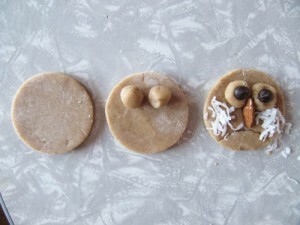 Place the rounds where the eyes would go for the owl and press a chocolate chip in the center of each. Press an almond between the eyes for the beak and then using a squiggly cutter press gently into the base of the owl for it’s feet (like below). Feel free to press coconut on the sides for feathers. Bake for 10-12 minutes. Allow to cool for a couple minutes on the baking sheets before transferring to a wire rack to cool completely. Owl be your valentine, ok? I LOVE these…I would like to have a whole herd..I mean FLOCK of them! sooo cute! 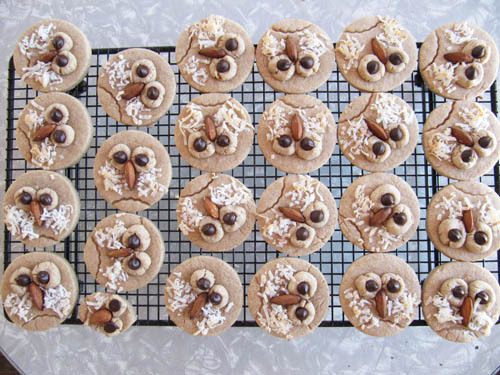 OOh, you should make them while you’re snowed in! 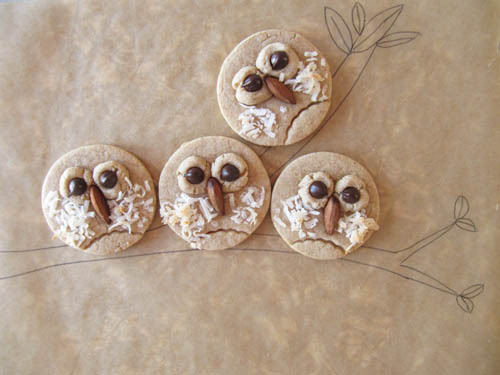 These are the most adorable cookies I’ve ever seen. Thanks, Dana! They were so fun. Is This => t for the small spoon or the table spoon ?